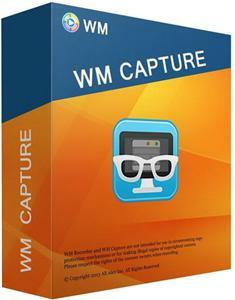 WM Capture is the only PC video recording program that captures video from any online source with perfect quality. If you can watch it you can save it. Record video from ANY Web site, regardless of format. You caneven record DVDs playing on your PC. And because it does not circumvent or hack DRM (Digital Rights Management) or any copyprotection technology, it’s 100% legal world-wide. – Great for capturing Cams and Video Chat sessions. – Saves ANY encrypted video that plays on your PC. – Creates highest quality videos with audio. – Save to MPEG, WMV, AVI, DVD-ISO & more. – Automatically detects the video window. – Record audio tracks from mic or speakers or both. WM Capture 6.1 is the only screen capture software that allows you to screen capture video from windows that are minimized or hidden. Once you enable “Background Mode” and select the video window to record, your video will automatically minimize leaving your desktop free for you to use. The added bonus is that since there is no image on your screen while it is being recorded, your PC is using less processing power!